Lovely, lovely, lovely…the magic of well-told Chinese folk tales, each with it’s own moral, memorable characters, and goodness, weave in and out of the adventure of Minli as she goes to meet the Old Man of the Moon, the weaver of destinies. Not a wasted word in this children’s book, where everything is put together with such artistry that you don’t want the story to end. What a joy, to find such a superb collection of Chinese folk tales, woven together into one adventure story with a beautiful message. The simple message of gratitude comes fairly late in the story, but it acts as the magic potion that begins to turn everything to gold, and when I finished it, I could only long for that same amount of gratitude and contentment that each character had discovered for themselves. Often folk tales from other countries are inaccessible to another culture because much is lost in translation. 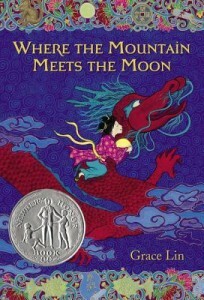 Grace Lin has masterfully created folk tales that can be universally understood. Since each chapter has a little tale of it’s own, this children’s book can easily be shared with young children, reading one small story a night. It could also be used in a school or home-school setting studying the ancient Chinese culture. It’s also an easy-to-read book for independent readers to enjoy. I must add one big laugh out loud I had. Whether it is true or not, the author managed to weave in a possible tale for the origin of my favorite Chinese tea, Dragon Well. When I read that, I smiled ear to ear, wondering who else will read this children’s book and enjoy the humor.